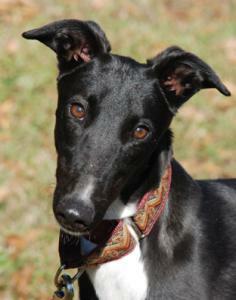 This gorgeous girl is a small, black, greyhound puppy that just turned a year old in December. She is came to us straight from the farm where she was raised. Her owners decided pet her out instead of racing her because she was sick as a puppy. After testing they found out that she has Pancreatic Insufficiency which means that her pancreas doesn't produce the enzymes necessary to digest food. All she needed were digestive enzymes added to all her meals and she ended up being fine. Before they figured out what the problem was her growth was effected and she was the runt of her litter. Shrimpy is pretty smallÂ at just over 50lbs which is tiny for a greyhound but she is active and healthy and just requires her digestive enzymes with her meals. Her sire is the famous Kiowa Mon Manny and her dam is Softball Phenom. Shrimpy is very social and has been sweet and friendly to everyone she meets. She went to a Petsmart meet and greet and was friendly with kids and adults. She didn't like kids hugging her or bothering her when she was laying down though so may need a home with older children that can understand not to do those things to her. She lived with cats in a previous home and had a great time playing with a large male Doberman. Because she is still a puppy she will need a home with a fence yard to run around in and won't be suitable for apartment living. She is a social girl that is energetic and fun. She loves people and loves to play.